New Delhi, August 29, 2016: The official delegation heading to Vatican on Sep 4 to attend Mother Teresa’s canonisation includes BJP and Cong leaders, a Supreme Court judge, an eminent lawyer and secretary general of Catholic Bishop Council of India. The 11-member delegation is to be led by External Affairs Minister Sushma Swaraj. As per the ministry, the 11-member delegation will include Public Accounts Committee Chairman and Congress MP KV Thomas, Goa Deputy Chief Minister Francis D’Souza, Supreme Court judge Justice Kurian Joseph, three Lok Sabha MPs — Anto Anthony (Cong), Jose K Mani (Kerala Cong), Conrad Sangma (National People’s Party) —BJP leader KJ Alphons, eminent lawyer Harish Salve and Bishop Theodore Mascarenhas, secretary-general of the Catholic Bishop Council of India. Swaraj and her delegation will be joined by the former’s ministerial colleague, Union Cabinet Minister of Food Processing Harsimrat Kaur. The team will be accompanied by MEA Secretary (West) Sujata Mehta. Earlier in the week, the ministry spokesperson Vikas Swarup had said two delegations, led by chief ministers, had sought political clearance to attend the event and been granted the same. The two CMs were Delhi Chief Minister Arvind Kejriwal and West Bengal Chief Minister Mamata Banerjee. Dhanbad, August 29, 2016: Jamaat-e-Islami Hind has identified localities with a mixed Hindu-Muslim population in the district where they will work to create unity through religious harmony. The organisation will constitute committees called Sadbhavana Munch in different areas irrespective of caste, religion and language. These committees will hold meetings once every month or fortnight and discuss various matters including communal harmony. Khwaja Arifuddin, a national committee member, said on Sunday coloured rumours should be avoided as it leads to conflict. “We started the drive on August 21. We expect to meet our target of establishing these committees by September 4,” said Arifuddin. Several programmes have been planned as a part of campaign, including street plays and symposiums, The Times of India reported. Areas like Horladih, Govindpur, Baliapur, Sindri, Kumardubi, Panchet, Bhuli, Wasseypur and Purana Bazar have been identified as part of the campaign. “Symposiums will be organised in schools and colleges to spread the message of communal harmony,” Arifuddin. Bangladesh, August 29, 2016: “I cannot maintain my family, I need a job, but being a believer of Jesus Christ, again and again I face problems in the workplace. Please pray for me,” said Anil Gomes, not his real name for security reasons, as he spoke to AsiaNews about his hard life as a Muslim convert to Christianity. He used to teach at an Islamic university in Bangladesh, but when his former colleagues caught him reading the Bible, he was fired. Since then he has been subjected to assaults, violence, and death threats. And now, with the country drifting towards Islamism, he is afraid of being killed at any time. Anil Gomes’ life changed in 1994, when he read a passage from the Gospel of John: “For God so loved the world that he gave his only Son, so that everyone who believes in him might not perish but might have eternal life” (3:16). He was in Saudi Arabia to attend advanced studies in Islam, after earning a degree in History in Bangladesh. In Riyadh, where he had gone to attend a death sentence, a man approached him and handed him a leaflet in Arabic. After completing his studies, Anil went back to his country of origin, where he began teaching at an Islamic university as an assistant professor of Arabic literature. Alerted by his colleagues, the vice-chancellor summoned him to his office and asked if he had converted to Christianity. Anil responded with utmost sincerity: “Yes, I am a follower of Jesus.” Then the vice-rector replied that “a kaffir (disbeliever) cannot teach in any Islamic universities”. The school administration then fired him. The Christian man was knocked unconscious and woke up four days later at Bangabandhu Sheikh Mujib Medical University Hospital in Dhaka. He had been taken there by a Hindu uncle, to whom his mother had given 85,000 Bangladeshi takas (about US$ 1,075) for admission. In tears and unable to speak, he remembers that his uncle promised to remain with him until he recovered. The hospital treatment lasted 3 months and 21 days. When he returned home, he was beaten again by Muslims from the local mosque. He was later abandoned by his family, which refused to acknowledge any inheritance, and the wider society. After losing his job a first time, he lost it again and again for the same reason. He was expelled from an NGO, an Islamic bank, and a financial institution. Then he found work with an evangelical NGO, but was forced to leave for lack of funds. The last job was in a sales office in Dhaka, where, however, the chief warned him: “Give up Christianity. If you say the prayers and read the Qur‘an all day, you will get the salary.” Anil declined. Not only did the would-be employer did not hire, but he also threatened his life. Today Anil is struggling to keep his family going. He married a Catholic woman and their child is in 8th grade at a Catholic school. Sometimes he talks about his story in seminars and meetings, but this work is not full time. The recent spate of murders of non-Muslims, bloggers and others converts to Christianity by Islamic radicals has increased even more his fears. “I am very worried about is happening to the country,” he said. Iran, August 30, 2016: Iranian-American Pastor Saeed Abedini, formerly a hostage held in Iran, has condemned the continued mass executions of prisoners in the Islamic Republic, including Christians, and asked why the United States, the European Union and the U.N. are not doing anything to stop Iran. Abedini posted photos of recently executed prisoners in Iran on Facebook Monday, noting that one of the men put to death was a Christian by the name of Ali Asadi. “Every Wednesday in Rajaeeshar prison [where] I was for more than two years, [the] Islamic Republic of Iran executes tens of people by hanging them,” Abedini wrote. “The saddest part of [this] horrible story is U.N., EU and U.S. don’t have any active plan to STOP [these] executions,” he added, noting that Western leaders regularly shake the hands of Iranian representatives at conferences and continue giving them money, yet know all about the systematic executions that have been going on for years. He added that there are a number of prisoners in Iran who decide to become Christians and change their lives around, but all of them are now in great danger because of their decision. “We need to PRAY for all of them” and for the Iranian regime to change its behavior toward its people and toward Christians, he added. The pastor argued that “we need to do something about it NOW, tomorrow is too late,” when it comes to speaking out for the human rights of prisoners. He also revealed that he will be speaking at an anti-Iranian government rally on Sept. 20 in New York. The U.N. has also said that Iran continues to execute prisoners without just cause. “It is regrettable that the government continues to proceed with executions for crimes that do not meet the threshold of the ‘most serious crimes’ as required by international law, especially the International Covenant on Civil and Political Rights, to which Iran is State party,” Ahmed Shaheed, Special Rapporteur on the situation of human rights in Iran, said last week, following reports that 12 inmates were set to be executed for drug-related offenses. Back in July during the National Council of Resistance of Iran rally in Paris, Abedini said that regardless of how grim the human rights abuses in Iran are, faith in God assures that hope remains. “My presence here proves that each act of resistance will be a victory. A victory for freedom. The message of God in the Bible says that we should resist the face of tyranny,” the pastor told close to 100,000 people in attendance. “We will soon see this rebellion in our country, in our hearts, and in our world, because Jesus Christ is bringing this message. The resurrection of the Iranian people shall arrive very soon,” he added. When your baby is catapulted into the world, you can’t help but feel joy. You echo the words of Leah in Genesis 30:13, “How happy I am! The women will call me happy.” But those first moments of bliss are quickly tried by crying infants, sleep deprivation, and all sorts of challenges. According to a Barna study, eight in ten moms feel overwhelmed by stress. Only nineteen percent of moms report being extremely satisfied as a mom. You know if you hang your happiness on your children’s behavior, you may have to wait a while before you can break into a wide grin. You’ve probably yelled this before: “How many times do I have to tell you…” Most likely, you were the one at your wits end while your child was unmoved. Instead of using long explanations or threatening tones, use actions and consequences that will stop your child in his/her tracks. For instance, when my daughter dawdled at breakfast (again), we simply took the food away and served it for lunch. No fanfare or emotion necessary. Don’t fall prey to the victim mentality that makes you feel like a loser all the time. Notice your negative self-talk and seek to turn your bad guilt into good guilt. Bad guilt says “I’m no good” but good guilt says “I did something wrong and I need to fix it.” Focus on the things you can fix and stop expecting perfection from yourself. Failure is an event; not a person. Are you still packing lunches for your sixth grader? It’s time to stop. Don’t do for your children the things they can do for themselves. Whether it’s tying shoelaces, homework, or washing dishes, we need to give our kids increased responsibilities as they get older. It will not only make you saner as a mom, it will prepare your children well for independence and adulthood. The Lord God Almighty stands ready to hear and answer your requests for your children. Make prayer a regular part of your mom life. To add accountability and power, invite another mom to pray with you weekly for your children. Remember what you hear over and over on flights? In case of emergency, place your own oxygen mask on first, and then help your children. We often sacrifice our health because we’re busy with our mom duties. Make sure you listen and respond to your body. Get a good night’s sleep, exercise regularly, and eat healthy foods that will act as fuel. Is your schedule running you ragged? Do you regret saying yes to soccer, baseball, piano, and gymnastics? At your next opportunity, choose less. Perhaps have your children do the same activity to lessen your drive time. The average child age 8-18 spends more than seven hours per day looking at screens. If you don’t have a game plan, it’s just too easy for free time to get gobbled up by mindless screen time. Use technology to bring you together as a family with activities like Friday night movie night and Skyping family members. If you want to learn how to cook, you learn from a cook. In the same way, if you want to learn to be a happier mom, you find a happy mom. Take this mom out to coffee and ask her to share her secrets. It’s extremely helpful to have a trusted advisor who can pray with you and answer questions about what’s happening with your kids. 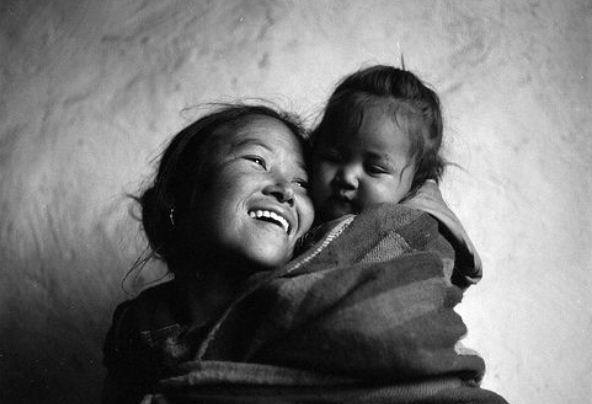 In the day to day race of motherhood, we can forget how fortunate we are to have kids in the first place. Psalm 113:9 says, “He settles the childless woman in her home as a happy mother of children.” Imagine what your life would be like if your kids were taken away. Be grateful for your children each day. Which of these ten ideas resonates with you the most? Vatican, August 29, 2016: On Monday Pope Francis met with Mark Zuckerberg, co-founder and CEO of social networking giant Facebook, at the Vatican, marking the latest in a string of visits from other major tech-heads this year. The theme of poverty and bringing a message of hope to the poor and marginalized is something Francis has spoken about ceaselessly since his election, barely stopping to take a breath in the past three years. Though he has publicly admitted in interviews to not owning a cell phone or using the computer, it seems that Pope Francis sees the value of the digital age, specifically in terms of the benefits new technologies can bring to evangelization and promoting human dignity. His meeting with Zuckerberg and Chan marks the fourth time he has met with a major tech head this year. On Jan. 15 he welcomed Eric Schmidt, chairman of Google parent company Alphabet, for a private meeting at the Vatican. A week later, he granted another private audience to Apple CEO Tim Cook. The Pope has also made an effort to engage with big name celebrities who share topics of interest such as Leonardo DiCaprio, with whom he met Jan. 28 in an encounter that focused on issues related to climate change and the environment. He has also started to make waves on social media, opening a Twitter account in 2012 and launching his own Instagram March 19, just weeks after his Feb. 26 meeting with the CEO and co-founder of Instagram, Kevin Systrom at the Vatican’s Apostolic Palace. The reason behind Francis’ meeting with Zuckerberg, who co-founded Facebook with college roommates and fellow students at Harvard in 2004, could be prompted by Zuckerberg and Chan’s decision in 2015 to give away virtually all of their $45 billion in Facebook Inc. shares. As of August 2016, Zuckerberg has an estimated net worth of $53.7 billion, making him one of the top 5 richest people in the world. 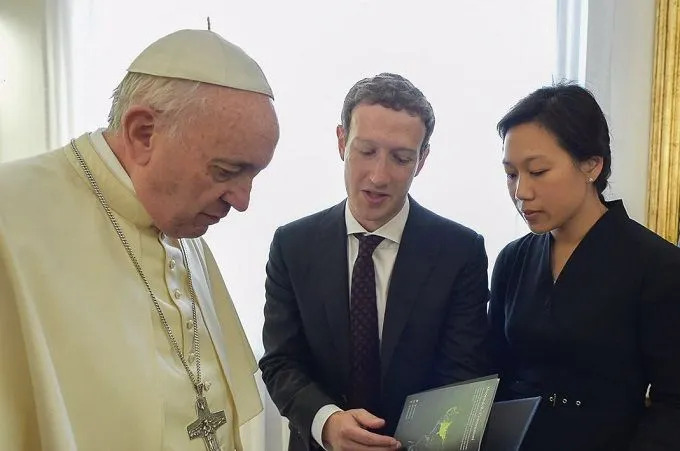 When Pope Francis notes, then, as he has frequently done, that according to some studies “80% of the world’s riches are in the hands of 17% of the population,” he’s referring to Zuckerberg. In their letter, the couple said they had a “moral responsibility” not just to their daughter, but “to all children in the next generation” to make the world a better place. The couple said their goals in donating their funds would focus on “advancing human potential and promoting equality,” and would consist of several long-term investments made in areas such as health and education, while at the same time working to decrease inequality and use technology to bring about positive change. Previously, in 2012, Zuckerberg and Chan had agreed to put the majority of their wealth to similar use with The Giving Pledge, a campaign founded by Bill Gates and Warren Buffett in 2010 to encourage the world’s wealthiest people to use their money toward philanthropic causes. In May, a report from Gizmodo dropped the equivalent of a social media bomb when several former Facebook employees said the company routinely suppressed conservative news in the social media giant’s “trending news” section. The former Facebook news curators said they were sometimes instructed to insert stories into the “trending” section that had not earned enough attention to be a trending topic, or that they had the freedom to “blacklist” topics that they didn’t want to appear in the section, meaning that the section was not organically curated by the interests of other Facebook users, contrary to popular thought. Although Facebook denied any allegations of bias and said they had launched an investigation into the issue, the episode has left many skeptical, and doubts remain. New Delhi, August 29, 2016: The Global Council of Indian Christians (GCIC) has reported that a Protestant pastor in Gonda district of Uttar Pradesh was beaten up by Hindu radicals on Aug 26. Sunny Tyagi, who converted to Christianity and became a Protestant Pastor, was beaten up by Hindu radicals who broke into a private house where a prayer meeting was being held, GCIC President Sajan K. George reported to Agenzia Fides. On August 26, around 8 am, Pastor Tyagi of the Church of the Assembly of believers was leading a liturgy in the house of a believer, when suddenly ten Hindu militants broke into the house and interrupted the meeting, threatened the faithful and started beating up the pastor, accusing him of proselytizing. The Pastor was not engaged in any criminal activity, and was not doing anything unconstitutional: he was beaten up for no reason. It is an act of gratuitous violence and a violation of religious freedom guaranteed by the Indian Constitution. The Global Council of Indian Christians strongly condemns the incident and calls on the national Commission for human rights to investigate and do justice. New Delhi, August 28, 2016: Mother Teresa’s canonisation portends more conversions to Christianity, an issue that Prime Minister Narendra Modi should have considered before deciding to send a delegation to the Vatican, the VHP said on Sunday. “The canonisation of Mother Teresa is an alarm bell that now there would be more conversions in India and more funds (for conversions) would be routed to India,” Vishwa Hindu Parishad (VHP) International Joint General Secretary Surendra Jain said here. He said granting of sainthood to a person based on miracles attributed to them was not “practical” in today’s times. “Do you expect miracles to happen in this age,” he wondered. Jain warned that with more conversions, there would be more unrest in the society. He said Modi should have considered the issue before deciding to send an official Indian delegation to the canonisation ceremony at the Vatican. “The issue of Mother Teresa’s services vis-a-vis religious conversions is not new. We have been raising it for years. I think the Prime Minister should have thought over it before he decided to send an official delegation to the Vatican,” Jain said. An official Indian delegation led by External Affairs Minister Sushma Swaraj is scheduled to attend Mother Teresa’s canonisation ceremony at the Vatican on September 4. On Sunday, Prime Minister Narendra Modi in his ‘Mann Ki Baat’ radio address paid tributes to the late Catholic nun for her services to the poor of India, saying that Indians should be proud that Mother Teresa is being officially declared a saint. The nun founded the Missionaries of Charity, a Roman Catholic religious congregation that runs hospices in India. She died in 1997. New Delhi, August 29, 2016: Over 10,000 people protested in Kandhamal district of the eastern Indian state of Odisha to mark the eighth anniversary of the country’s worst anti-Christian violence. The 2008 anti-Christian violence engulfed more than 600 villages and killed about 100 people, including disabled and elderly people, children and women. Some 350 churches and 6,500 houses were looted and burned down, making 56,000 people homeless. Several rapes were reported, including that of a Catholic nun. The anti-Christian rioting was sparked by the gunning down in Aug. 23, 2008, of a Hindu spiritual leader, Swami Laxmanananda Saraswati, 85, and four of his associates. Hindu extremists blamed Christians for the murders even though Maoists at that time had claimed responsibility for the deaths. The killings unleashed a reign of terror the following day that lasted for four months in the tribal-dominated Kandhamal district in Odisha (formerly Orissa) state. The state had also witnessed an earlier round of anti-Christian violence during Christmas 2007. “People are in fear. There have been subtle expressions from right-wing activists that anything can happen anywhere. The hatred has not been fully rooted out,” Father Santosh Digal who was part of the protest told ucanews.com. The protesters demanded reopening of cases of violence and a thorough and independent inquiry by impartial police officers and prosecutors. Father Ajay Singh, who has been fighting for the rights of the Kandhamal victims, told ucanews.com that the state government needs to implement a recent judgment of the Supreme Court of India to provide additional compensation to the victims. He said that about 40 churches and 52 NGOs and other voluntary organizations that were burnt or damaged in the violence have not been listed for compensation. “The situation is still not very good. The victims are suffering and some are still in rehabilitation camps and not able to return home even eight years after the violence,” he said. Yesterday Ivan Armadi Hasugian was sitting among the faithful during the Mass celebrated by the Capuchin priest Albert Pandiangan. After attempting to detonate an improvised explosive device hidden in his backpack, the boy launched himself against the priest wielding a knife and ax. Fr. Albert, who had just finished proclaiming the Gospel, managed to dodge the blow and in doing so was slightly wounded in his left arm. At that point the faithful immobilized the attacker and handed him over to police. Ivan Armadi Hasugian received some injuries to his face and back when the bomb failed to explode. Police in Medan added that the attack could have been motivated by the promise of 10 million rupees made to the boy by two unidentified men. Ivan Armadi Hasugian reportedly met with them a few days before the attack. Several witnesses in the church reported seeing two people flee the holy place when the bomb blast failed. It is not the first that an attack has taken place inside a church in Indonesia. 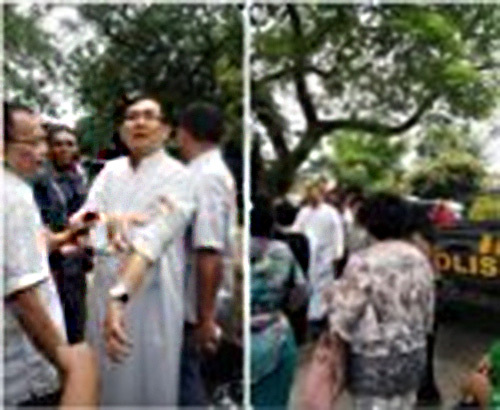 On July 22, 2001 a bomb left five dead and a dozen injured in the parish of St. Anne in Duren Sawit (East Jakarta).